With our diabetes-management-software-SiDiary you can easily import data from your Liberty Medical Liberty blood glucose meter and use lots of advantages of statistical analysis, trend analysis and graphics to improve your therapy together with your doctor. The great advantage of this SiDIary driver is that SiDiary will show the import screen automatically when the Wave 1 meter is plugged to the computer. 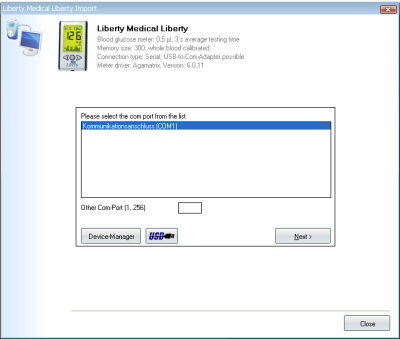 For the data import from Liberty Medical Liberty, the original manufacturer data cable is required. Here you'll find more details directly from the manufacturer Liberty Medical.